With summer in full effect, everyone's been looking for a way to escape the muggy city streets. But for those of us who aren’t able to move to breezier climates, there is another closer--and cooler--option hidden atop NYC's buildings: lushly planted urban rooftops. From elevated parks and urban farms to luxurious rooftop bars and lounges, taking a trip up to these sky-high urban oases is a great way to beat the heat and soak up spectacular views of the city skyline. Leslie Adatto, author of Roof Explorer's Guide: 101 New York City Rooftops, rounds up eight of her favorite and lesser-known urban rooftops from the five boroughs--hit the jump to see them all! While the 230 Fifth rooftop is open year-round, we’re willing to bet that this lush rooftop bar and restaurant likely looks its best in the height of summer. Planted with potted palms and blooming ornamentals, this family-friendly rooftop with its summery drinks feels like something straight out of the tropics–that is, until you turn around and see the amazing views of the Empire State Building and city skyline. Do you love the High Line’s views of the Hudson River, but prefer to avoid the summer crowds? To escape the throngs of tourists that flock to the elevated park, take a trip up to Le Bain, a rooftop bar located on the 19th floor of the Standard Hotel. This outdoor space is lined with artificial turf and sprinkled with colorful moveable seating for that extra summery and casual feel. According to Adatto, the Laurie M. Tisch Illumination Lawn is “one of only a handful of public-access roof lawns in Manhattan.” Set atop a restaurant, this well-manicured, sloping green roof was built in the shape of a hyperbolic paraboloid that contrasts with the linear silhouettes of the surrounding buildings. Views of neighboring green roofs can be seen from the Illumination Lawn, including those on the Barclay Capital Grove and the Claire Tow Theater. Completed in 2011, the 9,400-square-foot green roof that tops the Brooklyn Botanic Garden Visitor Center is a leading example of a successful, multifunctional living roof. Planted with 40,000 native grasses and flowers, this curvilinear roof meadow provides habitat, filters rainwater runoff, and helps insulate the building below. The green roof excellently captures the rich textures of a meadow plant palette as it changes through the seasons. There’s a giant gem of a living roof in the South Bronx, but you’ve likely never heard of it because of its location behind a 10-foot parapet wall. Guarded by high-security checkpoints and tall walls, this hidden green roof may lack the stunning views enjoyed on other rooftops, but it does hold the distinction of being the first extensive green roof in the South Bronx. The 5 Boro Green Roof Garden is the fifth-largest living roof in New York City. Featuring 30 different green roof systems side by side–possibly the only setup of its kind in the world–this massive rooftop landscape serves as a living roof laboratory that grows a variety of sedum, fruits, vegetables, herbs and berries. Visitors can see the multi-system green roof, including its solar panels and rainwater collection system, by setting up a prearranged tour with the New York City Parks Department. You may be surprised to learn that even the bees love to check in at the posh Waldorf-Astoria historic hotel. 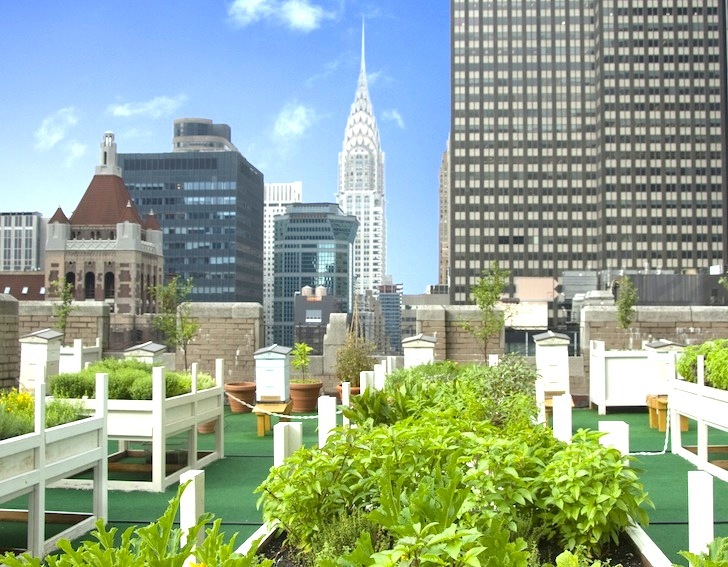 The famous art-deco building teamed up with the Horticultural Society of New York and the New York Restoration Project to convert nearly a third of the hotel’s rooftop into a thriving garden and apiary for honeybees. You can make reservations to dine at the restaurant below and tour the rooftop chef’s garden and apiary. Designed by prolific land artist Andy Goldsworthy, the Garden of Stones is a deeply symbolic rooftop garden commissioned by the Museum of Jewish Heritage. Built as a “contemplative space dedicated to the memory of those who perished in the Holocaust and a tribute to those who survived,” the 4,150-square-foot rooftop garden features 18 hollowed out boulders that, over time, will be fused together with the roots of the surrounding trees. Interested in learning more information about these stunning urban rooftops or want to see what other elevated oases the city has to offer? Check out Leslie Adatto’s new book ‘Roof Explorer’s Guide: 101 New York City Rooftops’ (also available as an e-book) and read about her latest urban rooftop explorations on her blog, Looking up with Leslie. Gorgeous rooftop designs. The idea of turning a roof into a contemporary garden is more than brilliant. It brings innumerable environmental benefits. For more inspiration, take a look at this https://www.rebelmouse.com/diana_newman/1048755258.html. I hope you enjoy it. 230 Fifth Ave. Manhattan While the 230 Fifth rooftop is open year-round, we're willing to bet that this lush rooftop bar and restaurant likely looks its best in the height of summer. Planted with potted palms and blooming ornamentals, this family-friendly rooftop with its summery drinks feels like something straight out of the tropics--that is, until you turn around and see the amazing views of the Empire State Building and city skyline. 444 W. 13th St. Manhattan Do you love the High Line's views of the Hudson River, but prefer to avoid the summer crowds? To escape the throngs of tourists that flock to the elevated park, take a trip up to Le Bain, a rooftop bar located on the 19th floor of the Standard Hotel. This outdoor space is lined with artificial turf and sprinkled with colorful moveable seating for that extra summery and casual feel. Overlooking W. 65th St. between Broadway and Amsterdam Ave. Manhattan According to Adotto, the Laurie M. Tisch Illumination Lawn is "one of only a handful of public-access roof lawns in Manhattan." Set atop a restaurant, this well-manicured, sloping green roof was built in the shape of a hyperbolic paraboloid that contrasts with the linear silhouettes of the surrounding buildings. 900 Washington Ave., Brooklyn Completed in 2011, the 9,400-square-foot green roof that tops the Brooklyn Botanic Garden Visitor Center is a leading example of a successful, multifunctional living roof. Planted with 40,000 native grasses and flowers, this curvilinear roof meadow provides habitat, filters rainwater runoff, and helps insulate the building below. The accessible green roof gives visitors the chance to experience the rich textures of a meadow plant palette as it changes through the seasons. 851 Grand Concourse, Bronx There's a giant gem of a living roof in the South Bronx, but you've likely never heard of it because of its location behind a 10-foot parapet wall. Guarded by high-security checkpoints and tall walls, this hidden green roof may lack the stunning views enjoyed on other rooftops, but it does hold the distinction of being the first extensive green roof in the South Bronx. New York City Parks Department Five Borough Administration Building, Randall's Island The 5 Boro Green Roof Garden is the fifth-largest living roof in New York City. Featuring 30 different green roof systems side by side--possibly the only setup of its kind in the world--this massive rooftop landscape serves as a living roof laboratory that grows a variety of sedum, fruits, vegetables, herbs and berries. Visitors can see the multi-system green roof, including its solar panels and rainwater collection system, by setting up a prearranged tour with the New York City Parks Department. 301 Park Ave. Manhattan You may be surprised to learn that even the bees love to check in at the posh Waldorf-Astoria historic hotel. The famous art-deco building teamed up with the Horticultural Society of New York and the New York Restoration Project to convert nearly a third of the hotel's rooftop into a thriving garden and apiary for honeybees. Reservations are needed to dine on this rooftop garden. 336 Battery Place, Manhattan Designed by prolific land artist Andy Goldsworthy, the Garden of Stones is a deeply symbolic rooftop garden commissioned by the Museum of Jewish Heritage. Built as a "contemplative space dedicated to the memory of those who perished in the Holocaust and a tribute to those who survived," the 4,150-square-foot rooftop garden features 18 hollowed out boulders that, over time, will be fused together with the roots of the surrounding trees.